For cars with front DRUM brakes. 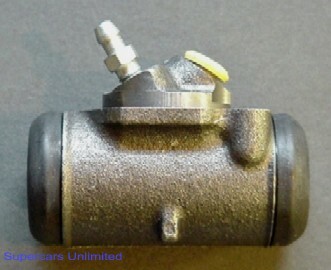 Wheel cylinders are brand new complete assemblies. Repair kits contain seals and boots to overhaul your cylinders. Sold per cylinder. 64-67 Left front brake wheel cylinder assembly. 64-67 Right front brake wheel cylinder assembly. 68-72 Left front brake wheel cylinder assembly. 68-72 Right front brake wheel cylinder assembly. 64-67 Wheel cylinder repair kit. Left or right. 2 req. per car. 68-72 Wheel cylinder repair kit.